With five beloved herbal blends in one box, this sampler provides rejuvenation and calm when you need them most. Wake up with a tangy Zinger, find afternoon comfort in Chamomile or Peppermint and wind down with soothing Sleepytime. 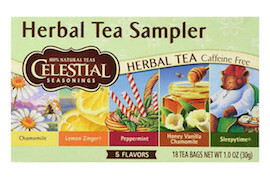 This Herbal Tea Sampler helps you recharge and relax all day long. Lemon Zinger: Hibiscus, rosehips, roasted chicory, orange peel, lemongrass, lemon peel and whole dried lemons, natural lemon flavor with other natural flavors and citric acid. Contains soy lecithin. Sleepytime-Chamomile: spearmint, lemongrass, tilia flowers, blackberry leaves, orange blossoms, hawthorn and rosebuds. Wild Berry Zinger: Hibiscus, rosehips, roasted chicory, orange peel, blackberry leaves, natural flavors of black raspberries, strawberries, blueberries, red raspberries, cranberries and cherries with other natural flavors and citric acid. Contains soy lecithin.